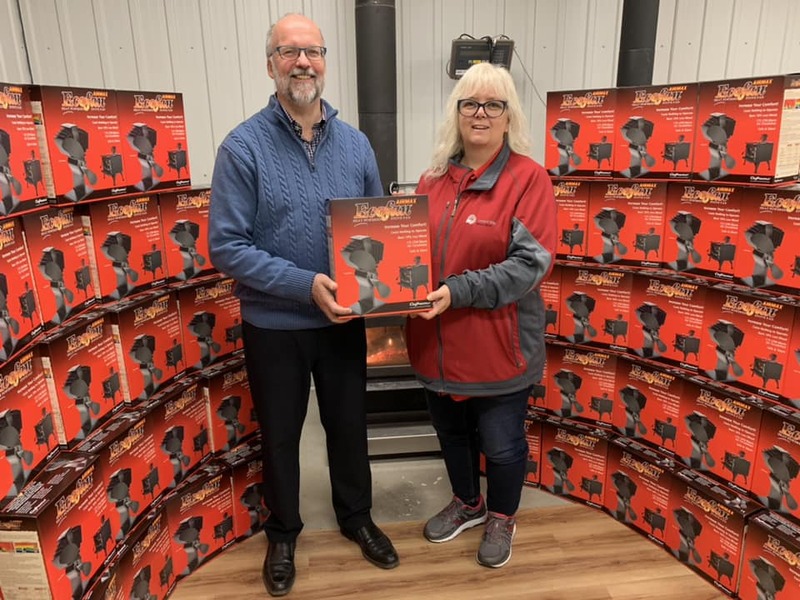 Georgian Bluffs, ON – Local manufacturer Caframo has donated 100 Ecofans to the United Way of Bruce Grey’s Utility Assistance Program, with a retail value of over $16,000. The United Way of Bruce Grey provides low income families with Utility Assistance, providing heating for homes using wood, oil, or propane. The Ecofans will go to recipients of the cord wood program. Since June 1, 2018, the United Way of Bruce Grey has provided wood for 101 families in the community, totaling $60,600. The Caframo Ecofan requires no electricity, generating their own power by converting the heat from a wood stove into electricity, which makes the fan spin. Reducing fuel usage and circulating warm air faster, a single Ecofan can reduce the amount of wood used by 18%, or almost an additional months worth of wood in a standard home. Caframo, who recently won the Business of the Year Award from the Owen Sound Chamber of Commerce, has been a strong supporter of local initiatives. Alongside the Ecofans, they have guaranteed the warranty on all donated products. The United Way is excited to receive this donation and continue to help families in our community. Thank you Caframo for your support! If you are in need of assistance with your utilities, please call 2-1-1 to check program eligibility. If you have accessed the United Way Utility Assistance Program and received wood, you can pick up your Ecofan at the United Way during office hours, Monday to Friday, 8:30-4:30.